Modern firearms come in two primary forms: smooth bore and rifled bore. A smooth-bore weapon has a barrel that is completely smooth on the inside, while a rifled-bore weapon has grooves that help guide a bullet down the length of the barrel. Each type of weapon has specific uses and differing levels of power and accuracy. Early handheld firearms typically had a barrel with a smooth bore, meaning the interior of the barrel through which a projectile moved was smooth. Often used as an all-purpose weapon, smooth-bore guns could fire either shot or a single bullet. However, when a bullet passed down the length of the barrel, it might spin in a way that would cause it to curve slightly through its trajectory. This made smooth-bore weapons inaccurate, particularly at long distances. In the 1700s, German gunsmiths began incorporating rifling into hunting weapons. The rifling spun the bullet as it moved down the barrel, and this spinning effect greatly increased the accuracy of the weapon. Today, both smooth-bore and rifled-bore weapons are available, depending upon the type of shooting required. Smooth-bore weapons have barrels with interiors that are perfectly smooth. When the weapon fires, the smooth surface allows projectiles to move quickly down the length of the barrel. Smooth-bore barrels are well-suited for firing multiple projectiles at the same time. On the other hand, rifled-bore weapons fire a single projectile. The interior of the barrel has spiraling grooves cut into the metal. As the projectile moves down the length of the barrel, the grooves grab the sides of the projectile, imparting a spin in the process. This spin stabilizes the projectile in flight and trajectory. Rifled-bore weapons, such as the modern high-powered hunting rifle, are extremely accurate. A marksman can use a high-powered rifle to hit the mark from many hundreds of yards away. Smooth-bore weapons are far less accurate and usually are used for short range. 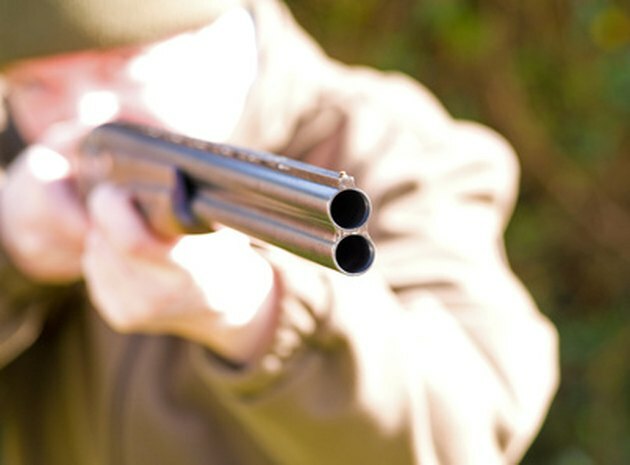 The shotgun is a typical example of a smooth-bore weapon and fires multiple projectiles at a short distance. This increases the likelihood of a strike on the target, simply due to the increased number of projectiles fired. Because smooth-bore weapons, such as shotguns, typically shoot multiple projectiles at short range, hunters frequently use them to bring down ducks, turkey or other fast-moving game. Police and military personnel also use smooth-bore guns as short-range defensive weapons. The concentrated firepower and accuracy of a rifle-fired projectile makes it an effective long-range weapon. Hunters typically use rifles for long-range shooting, often to bring down deer, bear, elk or other large game animals. In tactical situations, rifling provides accuracy both to smaller weapons, such as handguns in close-range shooting, and to long-range combat or sniper weapons. While shotguns are usually smooth-bore weapons, they can have a rifled barrel that fires a large bullet, known as a slug. This heavy-duty projectile is used most often for very large game. Some modern-day muzzle-loaded hunting weapons also use a smooth-bore barrel. Improvements in both weapon and projectile design, and more powerful gunpowder formulations, make these guns far more accurate than those of yesteryear. Today's Hunter in Washington: Why Are Some Long Guns Called Rifles?